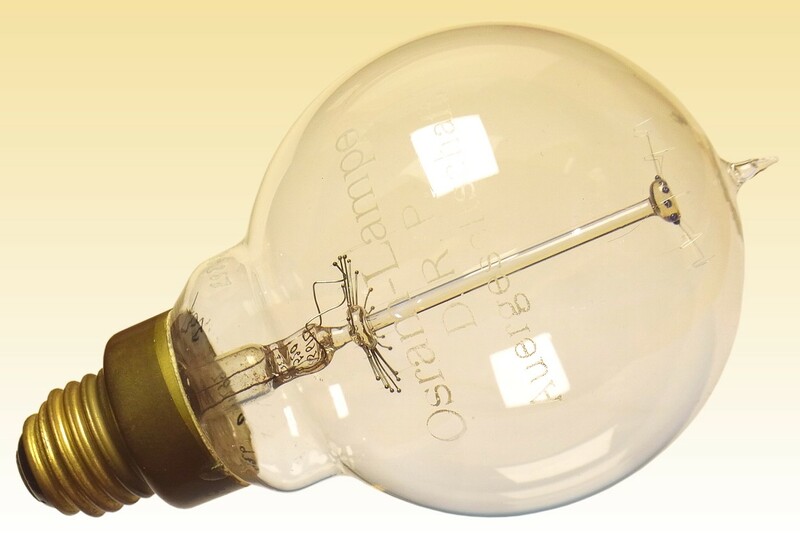 This universal-burning sintered sintered tungsten lamp is the second generation tungsten filament lamp of the German Auergesellschaft. 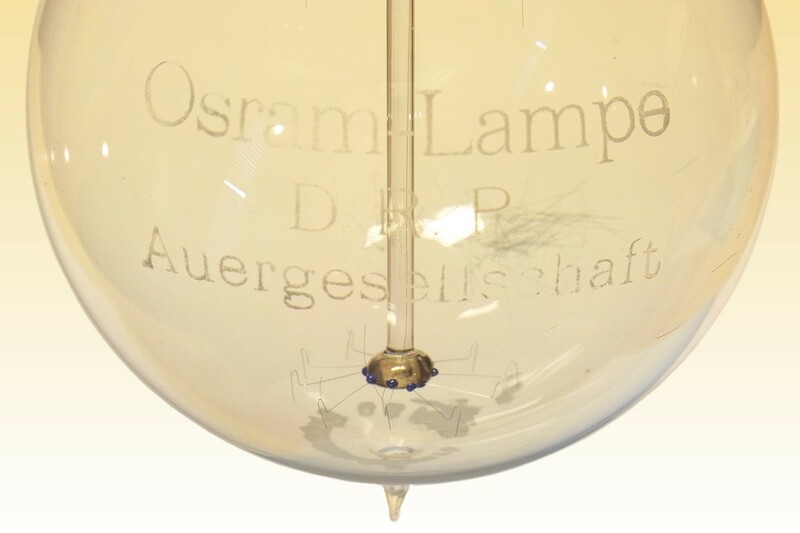 The company's first tungsten lamp was introduced in 1906 based on the work of Fritz Blau and Hermann Remani. 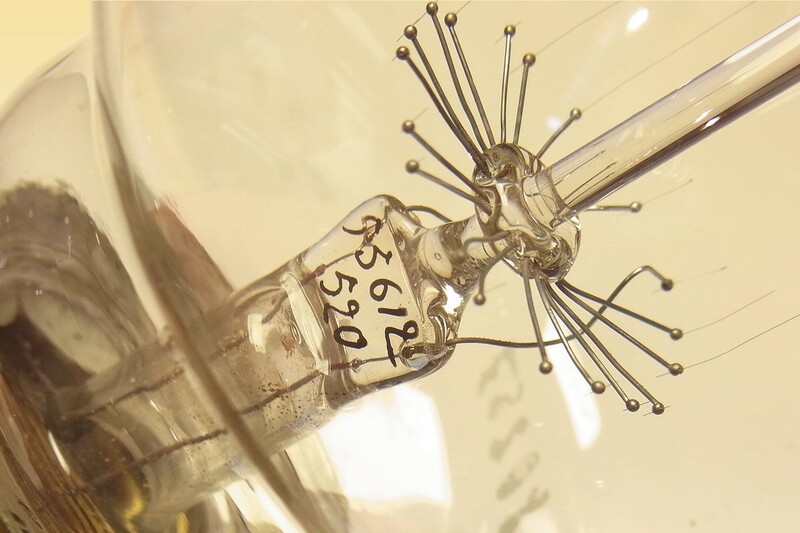 They produced a paste of tungsten particles in an organic binder, which was squirted into filaments according to the methods developed by Auer for the Osmium filament lamp in 1898-99. The filaments were then heated to carbonise the binder and render them conductive, and further heated by electric current in an inert atmosphere to form tungsten carbide. Finally they were heated in wet hyrdogen, the heat cracking the water and the resulting oxygen removing the carbon to yield pure tungsten, whose particles were sintered together by prolonged heating. 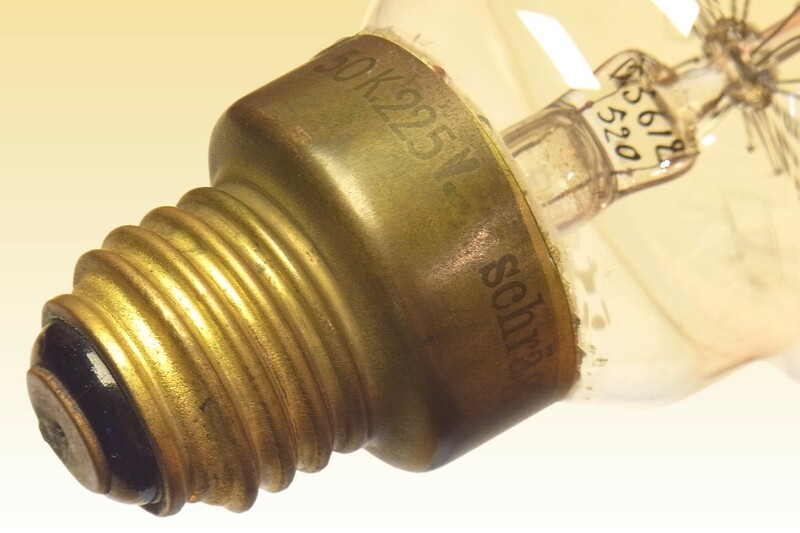 The filament mount construction of the 1906-style lamps was such that they could only be used vertically cap-up to avoid filament sag. The lamp on this page is an improved version, introduced in 1908 and suitable for operation in any burning position - as indicated by the word 'shräg' on the cap, meaning inclined or angular. This development was facilitated by a change in the design of the filament mount assembly. At the lower ends, the ten individual tungsten hairpins are attached to heavy support wires by the usual technique of arc-welding, to form small beads around the end of each filament. At the upper end, fine wires of refractory metal are used to hold each of the hairpins under tension. As the filaments expand during heating the supports maintain them under tension and prevent movement. 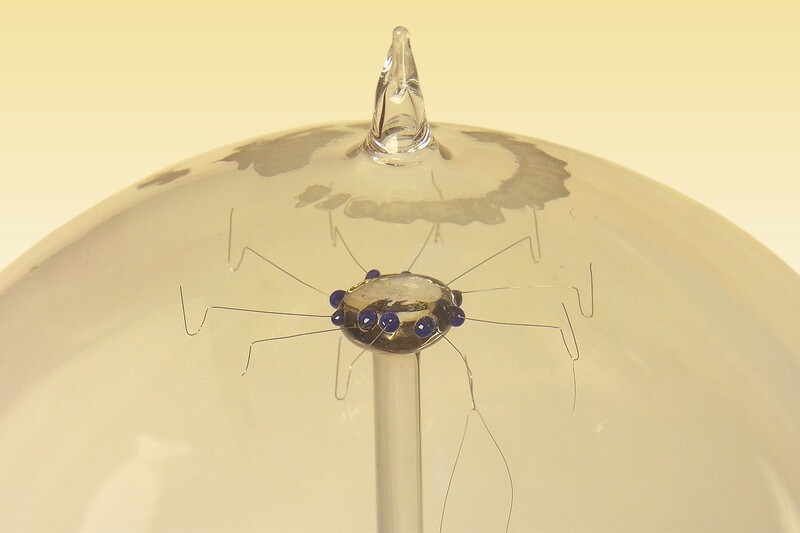 Curiously each upper support is attached to the central stem with a bead of blue glass, possibly to cater for a difference in expansion coefficient. References: 1) 100 Years Osram, Osram Centenary Book 2006, pp.17-19. 2) History of the Electric Lamp, Fin Stewart, publ. 2013, pp.154-155, 176-178. 3) An Illustrated History of Electric Lighting, Adam Allerhand, publ. Bez Budja Press 2016, pp.372-372.